(Mossad and CIA Funded) Anti-Putin protesters march through Moscow | Beyond The Yew : Saying NO to Zionism! 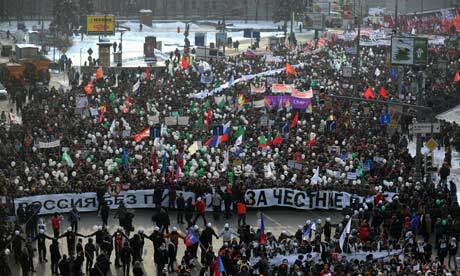 Tens of thousands of demonstrators have braved temperatures of -18C in Moscow to march through the city shouting “Russia without Putin” and calling for a rerun of disputed elections. In the latest of a series of mass gatherings since allegations of widespread government vote-rigging at the parliamentary poll on 4 December, the protesters walked an agreed route from Oktyabrskaya metro station to Bolotnaya Square, near the Kremlin. Much of the protesters’ anger is focused on the prime minister and defacto leader of Russia, Vladimir Putin, who earlier likened their white ribbons – worn as a symbol of solidarity – to condoms. Analysts say nascent discontent – especially among the urban middle class – grew in September when President Dmitry Medvdev, who is perceived as being a more liberal figure, announced he would not run for a second term, leaving Putin free this spring to return to the presidency, which he held from 2000 to 2008. Protest organisers claimed up to 120,000 people attended the march while police put the figure at 35,000. There was an irreverent atmosphere: some came dressed as clowns, or knights on cardboard horses, while others banged drums. Groups of communists waved Soviet flags, and several hundred nationalists marched in in a phalanx crying in unison: “Russia for ethnic Russians!” However, the majority of demonstrators showed no party or group allegiance, and many had fashioned their own placards. Natasha Orekhova, 26, a public relations specialist with a real estate firm, stood next to a friend who carried a fork with a pretend snake spiked on its tines, a reference to Putin calling the protesters Bandar-logs, the monkeys hypnotised by a python in Rudyard Kipling’s Jungle Book. Several opposition leaders spoke from a stage. Sergei Udaltsov, a radical leftwing activist, drew cheers when he tore up a portrait of Putin. The protesters are demanding a rerun of the parliamentary elections, the resignation of the head of the central election commission, reform of the political system and the release of political prisoners. So far, the only sop offered by the Kremlin is a simplified process for registering political parties and the return of direct elections of regional governors, but it remains unclear when these changes will come into effect. Attention now turns to the presidential election on 4 March. Putin is the clear frontrunner in that race and a rally of his supporters in a park on the edge of Moscow on Saturday also drew large crowds. However, he admitted this week that he may not get the 50% required to win in the first round of the vote, which would erode his authority. Police deployed about 9,000 officers for the protests. No serious incidents were reported.